Laois is an inland county to the southwest of County Kildare. It forms part of the central plain, though the Slieve Bloom Mountains are a prominent feature in the northwest of the county. There is much interest and beauty in the quiet by-ways of this area, away from the main roads that lead from Dublin to Limerick and Cork. Sporting attractions include fishing, hunting, shooting and golf. Laois (pronounced LEASH) is another of Ireland’s 12 land-locked counties. 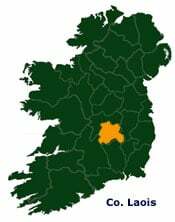 The center of Ireland is dominated by a flat plain, the lowest point of which is the Bog of Allen, and comprises most of the counties of Offaly and Laois. The heritage of the County includes one of the finest celtic fortifications in Ireland – the Rock of Dunamase and numerous fine houses of architectural merit. Visit the towns and villages associated with the Quakers and Huguenots or the waterfalls and valleys of the Slieve Bloom. There are several gardens of note, angling, golf and equestrian facilities for every level, and for the outdoor walker both long and short walks on which one can escape the stresses and rigor of everyday life.